In the beginning we all try to ask our friends, family and colleagues to subscribe to our channels to help it grow, all in the hopes that by doing so they will share the videos and see the channel take off like a rocket into space. The truth is this will only get you so far. If you haven’t yet decided on content to put out onto your channel or content they are interested in watching, this is only going to get you so far. You may even find they unsubscribe really quickly once they find out what you’re planning to do with your channel, and respectfully, may not want to have any association with it. 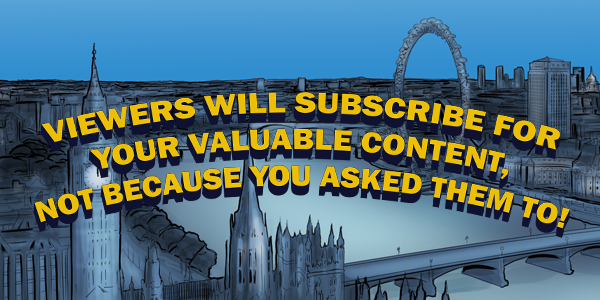 We want to keep subscribers from sticking around for as long as possible, if not indefinitely. So this is why creating content for a specific niche or audience is most important. A big mistake many start-up channels make is to make content for all different niches or industries, thus, being a jack of all trades on their channel. But this approach makes your channel a bit wishy-washy with content and visitors won’t know what exactly they are signing up for. I highly recommend that you pick a niche that you want to focus your content towards and stick with it. You want to be the GO-TO-CHANNEL for your niche. So if visitors have that interest in the topics you’re offering, they are going to be very interested in seeing more videos from you. Content as well should be heavily targeted towards what specifically your viewers want to see. Doesn’t it make sense doing it that way? spending your time wisely to produce videos that your audience want to watch rather than making content you think they want, but don’t. If you do produce videos people want, your subscriber count will inevitably and naturally grow. Something else worth noting is that subscribers tend to come and go. They may get what they needed from your channel and feel it’s no longer relevant to them and decide to unsubscribe. This isn’t necessarily a bad thing though, It’s like removing uninterested emails from a mailing list. So don’t fret, this is normal. To summarise, don’t rely on asking people to subscribe to you if they haven’t seen your content first, and instead consider focussing your content towards an audience that you wish to attract to you. Then you’ll see that people are going to follow you for your content, rather than because you’ve asked them too!